Posted on April 13, 2010 by Albert G.
But enough about my shopping habits…and on to the book. Can I just say right up front that this book belongs in every crafter’s library. 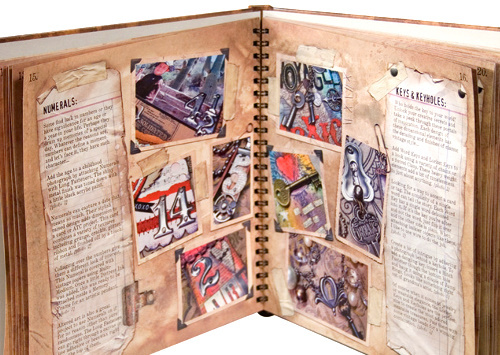 Whether you are a Tim Holtz fan like me or just interested in new methods, techniques, and ideas, this book is for you. The hardcover book (with interior spiral binding) measures approximately 8 3/4″ x 8 3/4″ and has 77 pages. But don’t be fooled by that number. The book is bursting with information and wonderfully rendered color photographs presented with Mr. Holtz’s usual panache and flair. Beginning with a brief introduction to the man and his studio–as well as a list of products he has developed or helped to develop and their intended uses–the book wastes no time getting to its essential core. It’s broken down into three major sections: Ideas, Techniques, and a Gallery. The final section is a wonderful gallery of projects done by Mr. Holtz that incorporate many of the techniques, tools, and examples used throughout the book. What really surprised me was that even someone like myself who has used a lot of Holtz products can still find new information on how to use products that you hadn’t thought of or didn’t realize you could do. I was really excited by the fragments projects (and will be working on some of those in the near future. 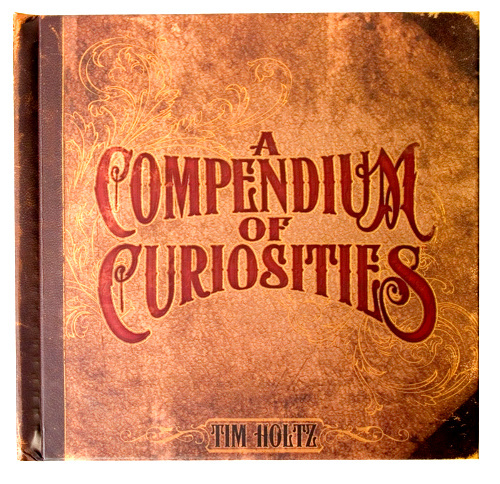 “A Compendium Of Curiosities” retails for $24.99 and, in my opinion, is worth every single penny. I highly recommend this book to anyone with even a faint interest in papercrafting. Posted on January 15, 2010 by Albert G.
This tri-fold card was an experiment to use several aging/staining techniques I will be sharing with you in the near future. I really like the effects you can obtain by using tea stains, inking, paint, masking and overlaying. It gives a bit of the vintage feel, but still retains an overall modern and stylish look.